Submitted for discussion by the National Committee of the Communist Party USA. Originally adopted on November 17, 2013. A sickness that has long plagued our country must be healed now, more than ever, if all working Americans are to earn dignity and respect. This sickness is racism. The stakes in our country couldn’t be higher. Everything working people have fought for and won is under attack. We are at a crossroads. A small group of billionaire-funded tea party extremists in Congress, determined to destroy President Barack Obama and any chance of health care for all went so far as to shut the government down. They are out to take control and undermine all government programs that are basic to the well being of working people. They are using racism to divide and confuse people into thinking that those who suffer the most and have the least are somehow responsible for the nations ills. Nothing could be further from the truth. As the saying goes, “an injury to one is an injury to all.” When African American, white, Latino, Asian, Native American people, native-born and immigrants, are played off against each other the only ones who benefit are the super wealthy 1%. Racism helps them cover up their war on all working people. With that weapon, they can pay some workers less and keep everyone divided and too weak to stand up for better wages, working conditions and quality of life. 150 years after the Emancipation Proclamation and 50 years after the great March on Washington for Jobs and Freedom which ushered in the Civil Rights Act and the Voting Rights Act, inequality, racism and bigotry still stand in the way of winning a better life for all Americans. As Martin Luther King, Jr put it in 1961: the labor hater and the race baiter are two heads of the same creature. From the exploding mass incarceration of Black and Latino youth, to low wage jobs and union busting, high unemployment, deep poverty, high mortality rates, policies of stand-your-ground, stop-and-frisk and deportations, to gerrymandered election districts and voter suppression, extreme racism is destroying democracy for all. Are you worried about the future of your job, your family, your social security, health care, veterans’ benefits? Are you worried about providing an education for your children? Are you angry about laws that make it harder to vote and weaken all important civil rights protection? Things can be changed if we understand the reason and work together for a common solution. But this fight won’t come easy. Some members of Congress are rationalizing inhumane cuts in food stamps by making it look like it’s “lazy” non-whites taking advantage. They cover up the fact that the majority of recipients are white, and are children, elderly and disabled. While they are cutting food stamps, these same officials are in the back room giving huge subsidies to the giant agricultural corporations. Fight racism, it is not only morally wrong, it also hurts all working people. Fear has long been used so people will blame each other instead of who is really responsible. Dividing us as working people against each other is a part of capitalism. It is how the rich get richer and maintain political control. The idea of “white supremacy” and viewing people of color as less is a mainstay of capitalist rule in our country, a carry over from the bloody but lucrative slave system. Today, young people care less and less about the color of their friends’ skin, and more and more about whether they will have a place to lay their head when they reach retirement age, as the mounting attacks on education, health care access, and workers’ rights threaten the stability of their lives. Now is the time to come together, reject what divides us and organize to fulfill the dream for everyone. 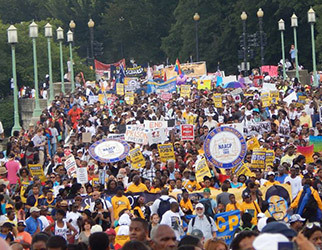 It is time for a new movement for civil rights and workers’ rights in our country to defeat institutionalized racism in the workplace in the community and at the voting booth. It is encouraging that this is happening in union organizing drives and popular voting coalitions across the country. Vote out those who split and divide and elect those who are for democracy for all and will truly represent the needs and hopes of the 99% in 2014 and beyond. We say African American, Latino, Asian, Native American, white — unite and fight for your rights!